Climate change contributes to environmental changes, such as intense heat waves, rising sea level, precipitation changes, air quality deterioration, and more intense storms or hurricanes. These changes have a myriad of affects to human health, including exacerbation of asthma and other chronic respiratory conditions from wildfire smoke exposure and poor air quality on extreme heat days; premature deaths related to air pollution and extreme weather events; increases in vector-borne disease transmission and geographic expansion; and mental health impacts resulting from extreme weather. Yet, many people are unaware of the health consequences of climate and change and still view this issue as a purely environmental concern. Further, climate change is a complex and often politicized issue, which can make conveying this information to patients, the public, colleagues, and policymakers difficult for health professionals. As the largest health profession and most trusted profession, nurses are in a position to educate and convey the importance of addressing climate change as a public health issue. However, in order to engage others, increase awareness, and motivate the health community, the public, and policymakers to move climate solutions forward, nurses need to understand how to effectively communicate with others on this complex topic. In our latest webinar opportunity, Founder and CEO of ecoAmerica, a nonprofit organization focused on building institutional leadership and support for climate solutions in the U.S., Bob Perkowitz provides nurses with communication tools, such as message framing and tested language, to help cultivate an effective voice. Bob gave this talk at the ANHE Climate and Health conference in Washington DC to rave reviews and we’re excited to be able to offer it here. The webinar is approved for 1 hour of nursing CEs. Evaluation must be completed to receive credit. Disclaimer: In the introduction, Ms. Huffling misstated one of Climate for Health’s partners. She was supposed to state the American Academy of Pediatrics. To view the webinar click on the slide above or go here. After watching the webinar, to receive 1 hour of nursing continuing education fill out the evaluation and post-test. You will receive an email with a link to download your certificate following successful completion of the evaluation and post-test. 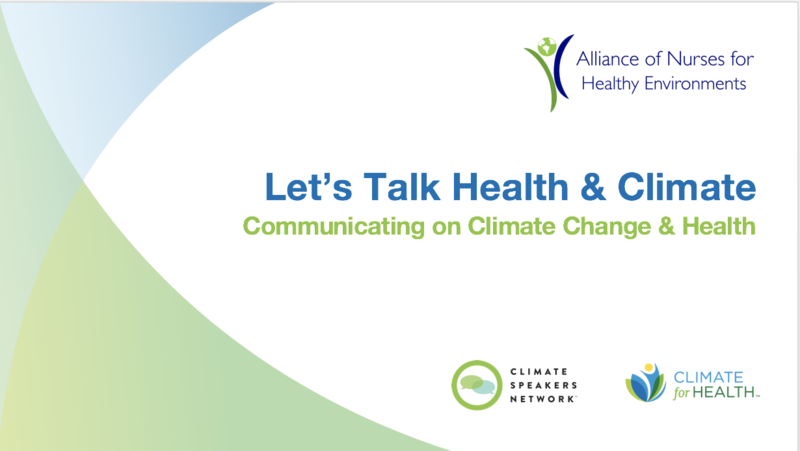 For additional information on ecoAmerica and Climate for Health’s research-based communications guidance, view their “Let’s Talk Health and Climate: Communication Guidance for Health Professionals” here. This program has been approved for 1 hour of nursing continuing education credits by California Board of Registered Nurses, Provider Number 16546.